Home > Pipe & Valve Marking > Pipeline Identification Labels and Tapes > Pipeline Flow Labels > Cold water flow marker label. Items per quantity: Sheet of 5 labels. 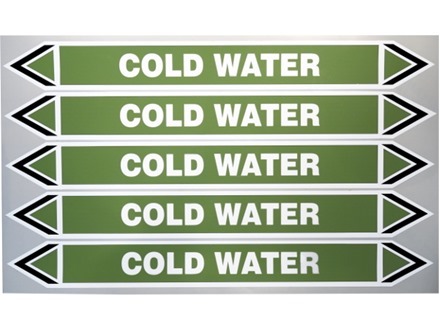 Hot water flow marker label. Cold water flow marker label, with detachable directional arrows. Colour reference 12D45. Pipeline flow directional labels. Cold water. Overall size 40mm x 384mm with detachable arrows. Colour reference 12D45. Produced to BS 1710 and BS 4800. Suitable for indoor and outdoor use. Supplied in sheets of 5 labels. ZPL202 Size 40mm x 300mm. Material self adhesive polyester with clear polyester laminate.